Federal Judge Blocks Texas Anti-Abortion Law : The Two-Way A controversial law seeking to ban a procedure for ending pregnancies after the 15th week faces a lengthy legal challenge. 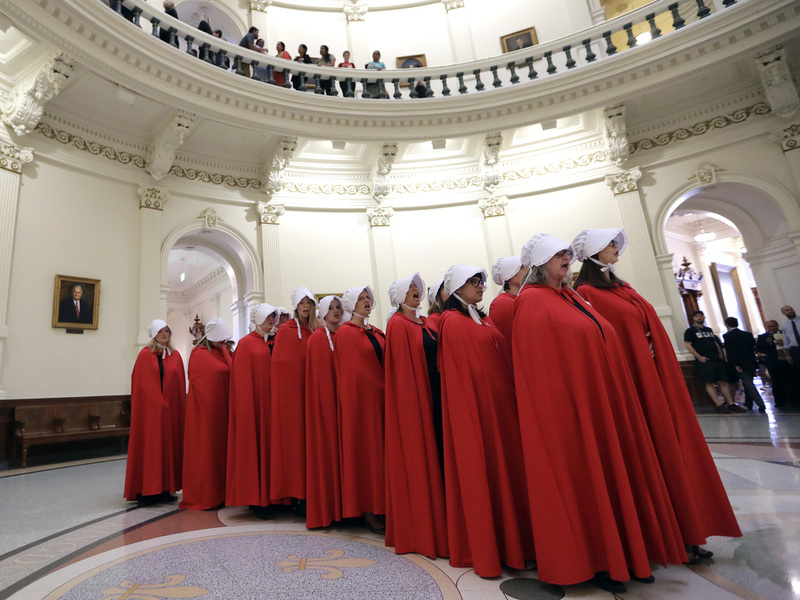 Demonstrators dressed as characters from "The Handmaid's Tale" to protest SB8 at the Texas Capitol in May. A federal judge temporarily blocked an anti-abortion law set to take effect in Texas on Friday that would have limited second trimester abortions in that state. U.S. District Judge Lee Yeakel issued an injunction lasting 14 days that prevents Texas from outlawing an abortion procedure known as dilation and evacuation, commonly used on women seeking to terminate their pregnancies in their second trimester. In his ruling, Yeakel wrote, "The act leaves that woman and her physician with abortion procedures that are more complex, risky, expensive, difficult for many women to arrange, and often involve multi-day visits to physicians, and overnight hospital stays." The ruling came in response to a lawsuit brought by abortion providers who argued that the Texas law, signed by Gov. Greg Abbott in May, would deny women access to a safe procedure. Earlier this week, in a hearing held by Judge Yeakel, attorneys for the state argued that dilation and evacuation, also known as D&E, is a "particularly gruesome procedure." In a statement, Marc Rylander, a spokesman for state Attorney General Ken Paxton, said, "Dismemberment abortions are gruesome and inhumane, which makes it troubling that a district court would block Texas's lawful authority to protect the life of unborn children from such a barbaric practice." "The Texas Attorney General will continue to defend our state's legal right to protect the basic human rights and dignity of the unborn," he added, indicating that Texas will appeal the ruling. The judge has scheduled a Sept. 14 hearing to consider whether to extend the order against implementing the law. The ban on D&E procedures in the second trimester was part of a broader measure, SB 8, that also restricted abortion providers ability to donate fetal tissue to researchers.